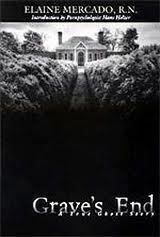 Elaine Mercado’s Grave’s End is another “true” ghost story we’ve read this semester in my MFA’s readings in the genre course. While this book claims to be true, it just wasn’t enjoyable for me, although I did enjoy it slightly more than The Amityville Horror. Whether or not this really is a true story, I don’t know. I’m very skeptical about books that claim to be true, with plenty proven afterwards that they aren’t, or only a small portion is. The “true” tag this book has may be part of the reason I didn’t enjoy it all that much; I went into this already with doubt, so instead of reading it for the story, I read it with judgment. Before reading this book, I had seen an episode of Paranormal Witness dealing with this story, and I had already established doubts about the veracity of the claims, so once I realized the episode was based on Mercado’s story, those doubts were carried along with me as I read. My doubts weren’t the only thing that stopped me from enjoying the story; the writing also played a part in that. The writing is often repetitive, which is one thing I usually become annoyed with in stories. Instead of focusing on the story, I start focusing on redundancies. The book is already a slim book, but it could have been shorter; and I feel a more succinct story would have been better. For the haunting itself, the fear the family felt wasn’t really present in the story. Rather than creating suspense for the reader (which can be done for nonfiction, if that’s what this really is), an exclamation point would mark the end of the sentence as if saying, “see how serious this is?” and that’s not a way for the reader to feel the same tension. Part of the reason why the terror can’t be felt is the atmosphere of the story is adequately built up; without atmosphere and mood, the reader won’t be drawn in as close as he or she needs to be in order to start feeling what the characters are feeling. What kills this is the expanded timeframe of the haunting. A haunting is scary, though I’ve never experienced one, which may add to my skepticism as sad as that is, but when an event occurs one day, then nothing for weeks or months before something else, the tension is lost. Granted, if this is a true story than modifying the dates and times would make it fiction, but there are still ways to write true to time, yet show just how uncomfortable the lapses between hauntings are. The suspense disappears fi an event happens, then you forget about what’s happened because of the length of time before another event. This is just another reason why I just couldn’t get into it. The characters, though, are a different matter. I thought they sounded real, and I could sympathize with them at times. I didn’t really feel like a particular character couldn’t exist, so this did help. I may be speaking about nothing but what I found wrong with this book, but it’s not a horrible story, just not one that I truly enjoyed. Perhaps a more succinct story with more atmosphere and tension would make for a better story.